The Massachusetts Science and Engineering Fair is happy to announce the addition of Adam J. Thomas to the MSEF Board of Directors. Starting in January, Adam became a member of the board and is especially looking forward to helping with the 70th anniversary gala coming up later this year. Adam has deep roots in a STEM education; growing up in Scotland and traveling all over the UK, Adam says he is grateful for the holistic education he received, with a good foundation in the sciences. The importance of a strong science background was something he was always aware of – his father received a PhD in Biochemistry and worked in food sciences. In school in Scotland, science fairs were not common. Instead, Adam participated in programs for young enterprise, learning about entrepreneurship and leadership. Adam sees a lot of overlap between STEM and leadership, and is a big supporter of interdisciplinary learning. In 2003, he moved to Boston, where he stayed for 8 years, and later moved to Milwaukee before recently moving back to Lexington. When first coming to the United States, Adam was involved with the Massachusetts Science and Engineering Fair (MSEF) through his company Pfizer. While working there, he became increasingly involved in the sponsorship and support of MSEF and even helped develop the first MSEF online judge recruitment tool by securing a grant from the Pfizer Foundation and sponsoring the development of the tool. While this was challenging, Adam worked with a local internet company to set up the system, and found his work very rewarding. Moving back to the Boston area has inspired him to get more involved with the science fair community again. After years of seeing science fairs, Adam has a good understanding of their importance and impact on not only the students themselves, but the community as a whole. He says that a lot of the major problems facing the world today and in the future, like climate change and an increasing global population, need an educated workforce in STEM to tackle these challenges. In addition, the growing fields of medicine and health technology require this essential scientific understanding. As a father of two young daughters himself, Adam wishes to see their education reflect these needs and give them the necessary tools to succeed and help the world. Today, Adam works at Synlogic Inc., where he has been the Chief Human Resources officer since July 2017. His work there has taught him about the need for a good team, and that a key aspect of solving today’s scientific problems is building and maintaining that great team. As a leader in Synlogic Inc. and throughout his career, Adam advises students looking to be a leader in their school or community to listen to others and understand them: the ability to empathize is important for leaders in every field. 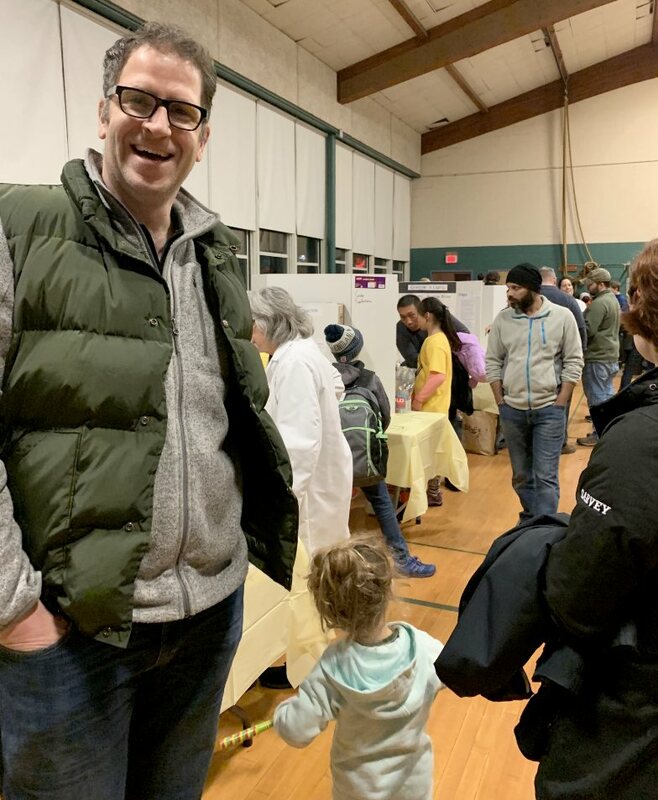 Looking forward, Adam hopes to see the quality of STEM programs develop at all schools, involving increased funding, better resources, improved teacher training for science subjects, and more. As he can say first hand, everyone benefits from a broad scientific education, and this starts with good STEM opportunities at all schools. Science fairs specifically are important to Adam because of the freedom they offer students to test out their hypotheses and work on real problems. He wants his daughters to embrace STEM with open arms, and he looks forward to planning a science fair that his daughters might one day participate in. We would like to thank Adam for speaking with us about his experience, and we look forward to all the input and help he will provide as a member of the Board of Directors!